Our church first began under the leadership and ministry of Brother Wiliam Stokley of Anderson, South Carolina as Grace Assembly. In February of 1998 Brother Luke Gibson was officially elected as the Pastor of Grace Assembly. 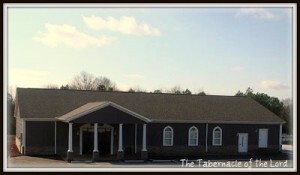 Under his ministry and leadership the church grew and the decision was made in 2007 to construct a new sanctuary in a new location with a new name. In December of 2008 we had our first service in the new sanctuary now called The Tabernacle of the Lord in Townville, South Carolina. Today we have believers from many different places that fellowship with us locally and as well around the world through live streaming. We enjoy the fellowship of believers around the Word of God and want to take every opportunity to redeem the time. Each year we have special meetings in the month of June and welcome everyone to be in fellowship with us. We welcome everyone to visit us during our services. We believe the Bible is the inspired Word of God and is our absolute. We believe the Word of God is relevant for today and has power to change us through the Holy Spirit. The new birth is a must in order to be conformed to the image of Jesus Christ. We desire to not only attend a place called The Tabernacle of the Lord but we desire to become a tabernacle where the Lord dwells in preeminence.